Many U.S. students begin their early years in school feeling safe, but that feeling subsides as they progress through their education. Results from the 2015 Gallup Student Poll found that while 63% of fifth-graders surveyed strongly agree that they feel safe in school, less than half as many high school juniors (31%) strongly agree. The 2015 Gallup Student Poll results are based on a convenience sample of more than 900,000 U.S. public school students in grades five through 12 from 3,300 schools, representing more than 550 unique school districts across 46 states. The school safety item is part of the Engagement Index, which measures students' involvement in and enthusiasm about school. Safety is a prerequisite for student learning and growth, and it is a foundational element of school engagement. Students who feel physically, psychologically and emotionally safe are best positioned to learn and contribute to the learning of others. As schools across the nation establish systems and practices to protect students from a variety of threats, Gallup Student Poll data suggest there are additional measures school leaders, teachers, after-school caregivers and parents can take to boost a sense of safety and belonging, and to curb the decline in school engagement year over year. Parents also have concerns about school safety. A recent Gallup poll of the U.S. adult population shows three in 10 parents worry about their child's safety while they are at school, and one in 10 report their child has expressed concerns about safety at school. 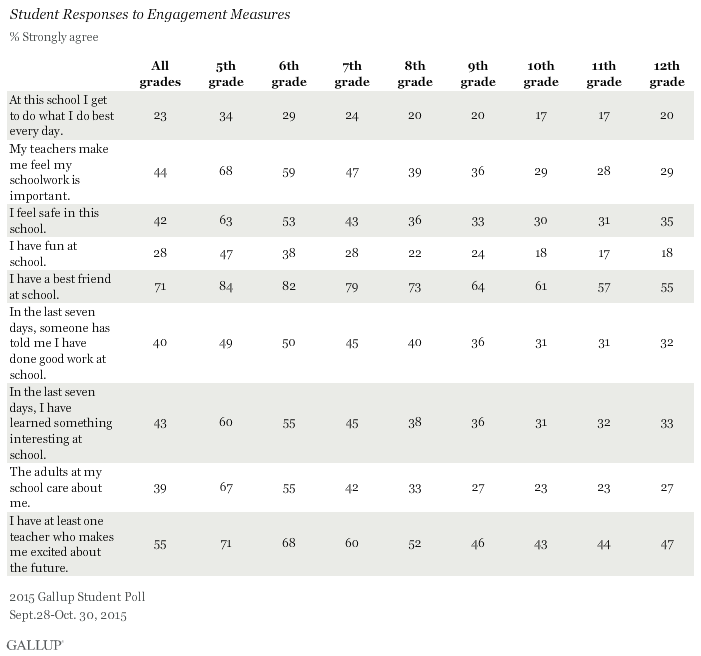 The percentage of students who strongly agree with each of the other eight items in the Engagement Index decreases markedly by grade level, suggesting the students surveyed have difficulty making emotional and psychological connections at school as they progress. As students get older, fewer strongly agree with items gauging relationships with others. Nearly three times as many fifth-graders (67%) as 10th- and 11th-graders (23%) strongly agree that the adults at their school care about them. And just 43% of sophomores strongly agree they have at least one teacher who makes them excited about the future, compared with 71% of fifth-graders. Further, fewer 12th-graders than fifth-graders strongly agree they have a best friend at school, 55% versus 84%, respectively. Several Engagement Index items address experiences at school that elicit less positive responses from older students. Half as many high school sophomores and juniors (17%) strongly agree they get to do what they do best every day at school, compared with fifth-graders (34%). And while nearly half of fifth-graders surveyed strongly agree they have fun at school, just 17% of juniors strongly agree with this statement. Additionally, about half as many sophomores and juniors (31% and 32%, respectively) as fifth-graders (60%) strongly agree they have learned something interesting at school in the last seven days. Far fewer 10th- and 11th-graders (31%), compared with fifth- and sixth-graders (49% and 50%, respectively), strongly agree someone has lauded their good work at school. Help students think about what they do best and provide them with activities and projects where they can do those things often. Focusing on students' strengths first rather than harping on their weaknesses will help students stay engaged with learning and create hope for the future, replacing some of the fear they may harbor about today. Caring learning environments yield more collaboration and productivity. Every student deserves to have at least one adult who believes they have true potential. Find ways to ensure every student has at least one caring adult at school who is for them, and who is interested and excited about their future. Make sure the student knows the adult is on their side. Elementary school children traditionally earn gold stars or stickers for a job well-done. Gallup Student Poll data suggest that the gold stars dwindle in upper-grade levels, or they may be reserved for just a few. Recognition may inadvertently be replaced with an intense focus on academic rigor or preparation for high-stakes tests. Build a culture marked by meaningful recognition. Recognition does not only need to come from teachers. Invite partners outside of school, namely parents, coaches, church leaders and out-of-school leaders and caregivers to seize an opportunity to fill a student's bucket by recognizing their talents, efforts, achievements, kindness or citizenship. Boards of education, administrators and teachers continue to wrestle with the enormous challenge and critical task of creating safe spaces for kids to learn and grow. While they do this, they should continue to focus on the subtle everyday engagement builders that can help increase students' sense of safety and belonging at school. Read the full 2015 Gallup Student Poll results. Three in 10 U.S. parents say they fear for their child's safety at school -- similar to recent years, but lower than after Columbine and Sandy Hook. 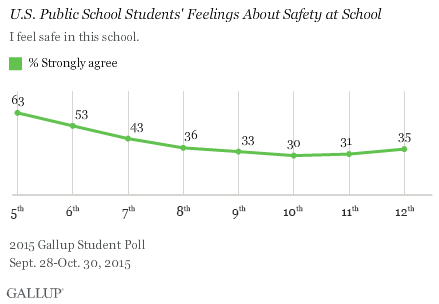 One in 10 parents say their child has expressed concerns about safety at school.